Below you will find photos and descriptions of the different types and styles of boat covers that we build. Every SLO Sail and Canvas cover is physically patterned from the particular model of boat that the cover is designed for. This ensures a perfect fit for every cover. We are always acquiring new patterns so feel free to contact us if you don’t see your boat offered. Not every style of cover is available for every boat, so you'll need to look at the listings specific for the boat you are interested in. This cover is designed to be used when the mast and rigging are removed from the boat and can be used when trailering. The photo below shows a flat cover, which depending on the boat, may have webbing loops in the middle to help you support the middle of the cover in order to promote drainage. As a rule, these covers do not have any type of cutout in them. The deck cover is held on with a 1/4" bungee that runs through the hem of the cover. Webbing loops approximately every 3 feet around the cover also come standard which allow you to securely tie the cover to either the boat or trailer. 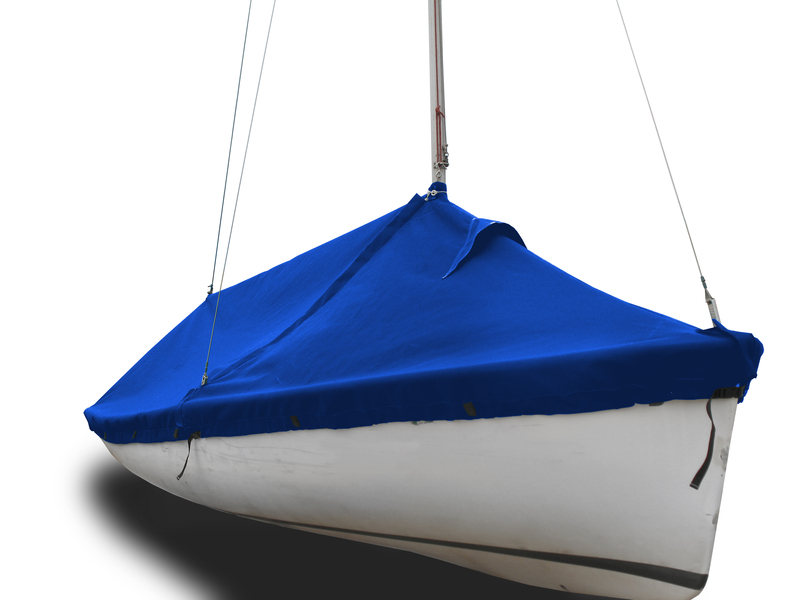 This cover style is designed to be used if the mast is to be left rigged. The cover can also be used if you remove the mast for trailering just like the deck cover. 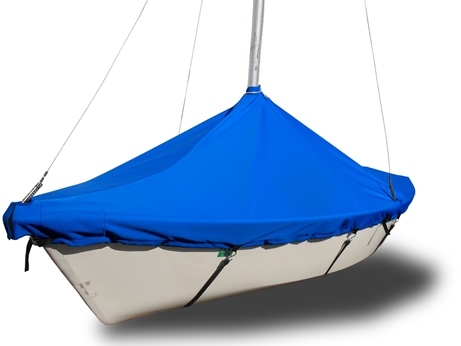 These covers feature a cutout for the mast and any supporting rigging that is standard. Similar to the Deck cover, the mast-up flat cover features webbing loops along the centerline which can be used to help promote drainage. 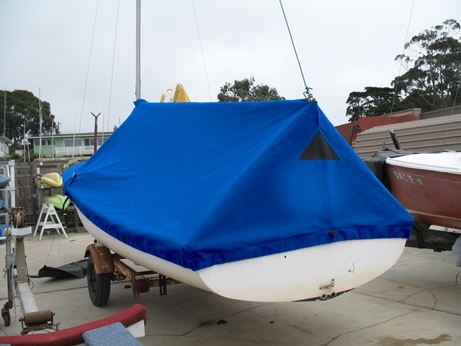 A heavy duty (#10 black YKK tooth) zipper closes the cover from the mast cutout to either a shroud or the side of the cover depending on the boat. This zipper will have a covering flap to protect it from UV damage. We only use plastic zipper sliders which helps to eliminate zipper failure due to corrosion. The smaller cutouts around other rigging will have a Velcro closure to the hem and a side release buckle connecting the bungee in the hem. The mast cut out features a 6" tall collar that closes with a rope tie to help keep water from entering the cover. These covers are not designed to be used with the boom attached to the mast; you will need to remove the boom and store it in the cockpit. The mast-up peaked cover is designed to be used with the mast rigged and the peak of the cover is designed to fit just above the gooseneck. In most cases, this will allow the boom to be left attached to the mast with the back end sitting on the cockpit floor. This cover cannot be used for trailering as there will be too much excess material. Similar to the Deck cover, the mast-up flat cover features webbing loops along the centerline which can be used to help promote drainage. A heavy duty (#10 black YKK tooth) zipper closes the cover from the mast cutout to either a shroud or the side of the cover depending on the boat. This zipper will have a covering flap to protect it from UV damage. We only use plastic zipper sliders which helps to eliminate zipper failure due to corrosion. The smaller cutouts around other rigging will have a Velcro closure to the hem and a side release buckle connecting the bungee in the hem. The mast cut out features a 6" tall collar that closes with a rope tie to help keep water from entering the cover. Our boom tents fit over the boom when it is raised parallel with the water and are designed to cover only the cockpit of the boat. 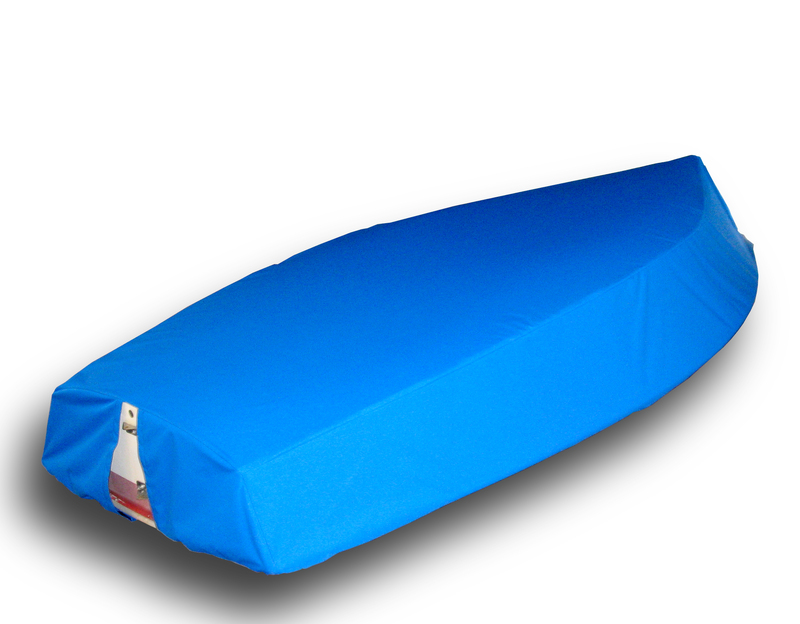 We currently only offer these covers for a small number of boats. Many boom tents fasten in front of the mast to help enclose the cockpit. These covers all have 6" tall mast collars at the front and a grommet on centerline at the back to help tie the cover in place. We sometimes use rubber coated aluminum hooks that hold onto the rubrail to help secure the side of the boom tent. The mast-up tented cover is the ultimate yard cover. These covers, like the boom tent fit over the boom when it is raised parallel with the water. Unlike the boom tent however, they cover the entire deck of the boat. The cover slopes down to the bow from the gooseneck and is fully enclosed at the back. There is a vent at the bow and at the transom to help promote airflow through the cover. A heavy duty (#10 black YKK tooth) zipper secures the cover from the mast cutout to the shroud base and has a covering flap to protect it from UV damage. The smaller cutouts around other rigging will have a Velcro closure to the hem and a side release buckle connecting the bungee in the hem. The tented cover is held on with a 1/4" bungee that runs through the hem of the cover. 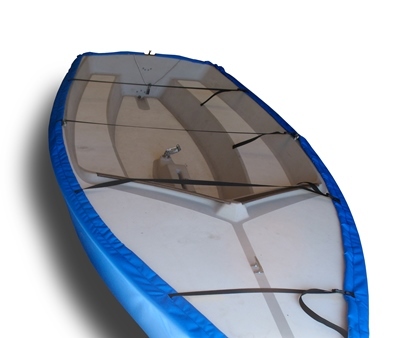 Webbing loops approximately every 3 feet around the cover also come standard which allow you to securely tie the cover to either the boat or trailer. 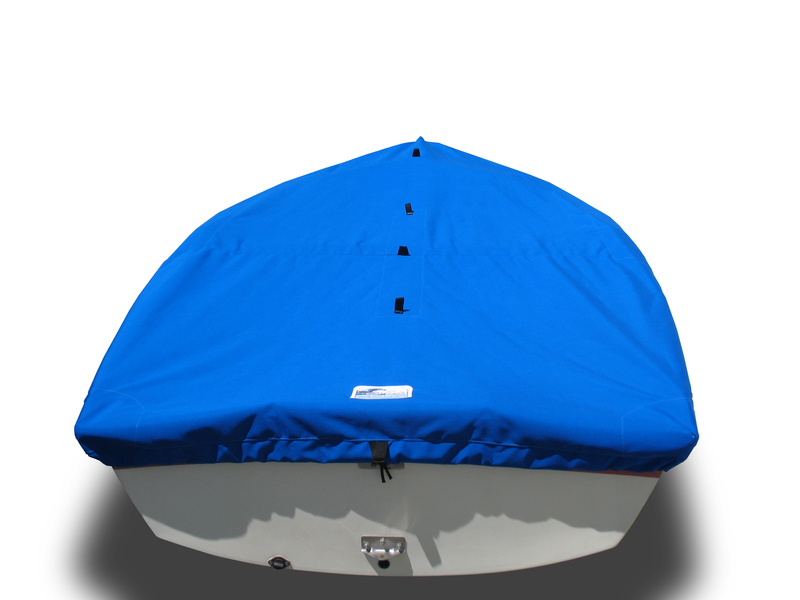 Our bottom covers fully enclose the bottom of your boat. 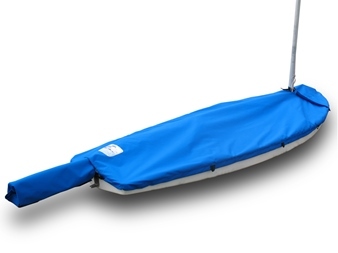 These covers feature a 1/4" bungee that runs through the hem of the cover and adjustable webbing straps with side release buckles across the deck of the boat. Most bottom covers can be built in two different styles, a solid transom and a split transom. The solid transom fully encloses the back of the boat with reinforcements for the pintels/gudgeons. Most covers can be built with a split transom which is open down the centerline of the transom. This allows the pintels/gudgeons to be accessible and can also allow the cover to drain if the bow of the boat is raised. The cover below shows the split transom. 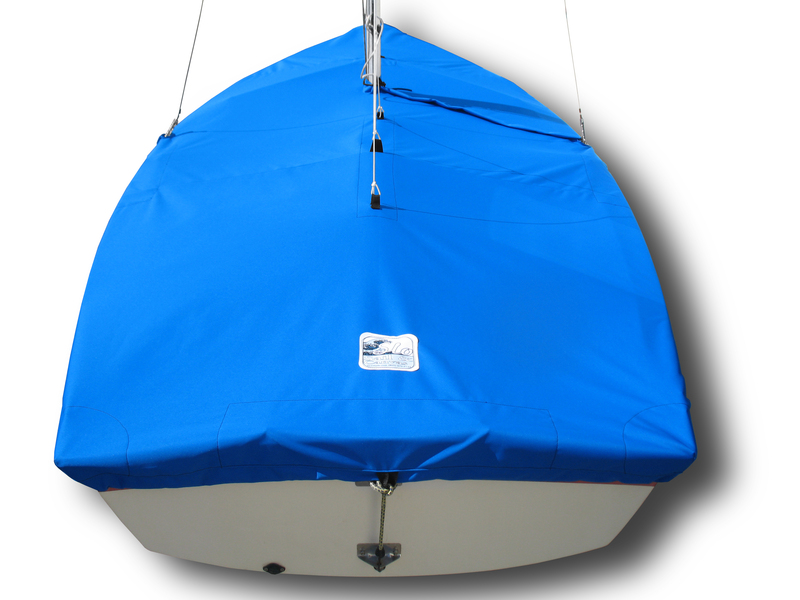 We offer two special top covers for the Sunfish that we don't really offer for any other boat. The first of these covers is our Sunfish spars on deck cover (1st photo below) which is basically a deck cover with a little extra space underneath to accommodate the spars (boom and mast) lying on the deck. There is also an extra covering flap sewn to the back of the cover to fully enclose the spars when they hang off the back of the boat. The other special cover we make for the Sunfish is the mast up cover (2nd photo below). This is essentially just a mast up version of the spars on deck cover with the covering flap at the back of the cover. 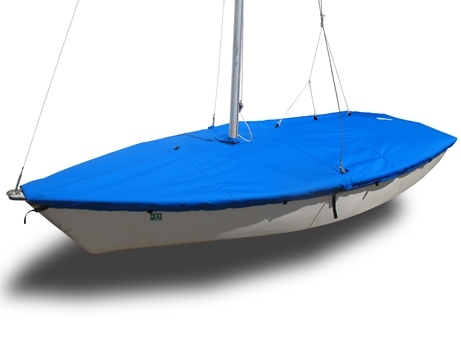 The mast up Sunfish cover has a cutout for the mast, a mast collar to seal the cover around the mast, and a zipper to the edge of the cover. Straps – When the strap upgrade is selected, we replace the webbing loops along the side of the covers with permanently attached 1” wide adjustable webbing straps designed to fit under the hull and attach to the other side of the cover with side release buckles. Reflective tape – When reflective tape is selected, we add a strip of silver 2” wide reflective tape to the back of the cover which helps make it more visible both in the boat yard and on the road. Mesh drain – Some of our bottom covers are offered with a mesh drain which is usually added to the cover near the cockpit drain and will help the bottom cover drain if the boat has any water in it. We use the same mesh that we build our trampolines from which helps keep dirt and debris out of the cover and is also very durable.